Why the Ocutech Falcon Autofocus Bioptic is important. 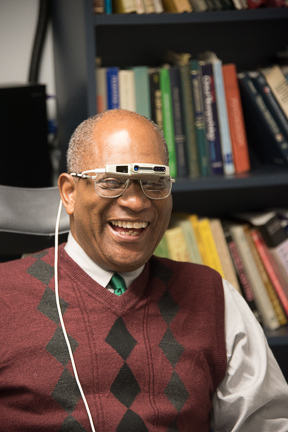 My vision rehabilitation professor taught us that in low vision care we prescribe adaptive devices, but it won’t be the device that’s doing the adapting. The implication of this observation is that low vision aids can create a less-than-normal visual experience, and hence they place demands on the patient to learn to use them and modify their behavior to integrate them into their lives. The less natural and less convenient a low vision aid is to use, the less likely it will be adopted and incorporated into one’s daily life. Despite that so much of low vision care involves supporting reading, there is a growing body of evidence that shows that loss of distance vision has been associated with a greater impact on quality of life (QoL) than does the loss of reading vision. While many think of bioptics as intended solely for driving, there are very compelling reasons to prescribe bioptics for a range of other distance seeing needs. Distance vision is an important social sense. We use it to make eye contact, read body language and feel connected to the world around us. Loss of distance vision can cause feelings of isolation, can lead to depression and even contribute to cognitive decline 1,2 . Distance vision is also a vector to opportunity—it can support independent travel and both academic and vocational prospects. That’s not to say, one cannot be successful with reduced vision, but it certainly makes life more challenging. If a new refraction were to make things dramatically better for an individual, someone probably dropped the ball way before the patient got to the low vision clinician. It’s infrequent that we can achieve a dramatic functional gain solely with a change in refraction. Remember, small changes in refraction do not beget large changes in acuity. So, an individual with lower acuity (~20/200 or less) won’t benefit from a half-diopter change, while someone with rather good acuity (~20/70 or better) might. That’s why it usually pays to check the refraction for individuals with better VAs. So, when a change in glasses doesn’t help, and when moving closer is not an option, the next step is telescopes. Our goal is to prescribe a telescope power that provides approximately 20/40 though the device—an acuity level usually adequate for most all visual activities. Patients will first notice the narrower field of view through the telescope, which is why you should prescribe Keplerian telescopes whenever possible as they will provide the widest field of view at powers of 3x and higher. the device. In addition, if they’re focusing on an individual, it’s a rather aggressive behavior to be aiming and focusing—the user is uncomfortable doing it, and the individual isn’t too happy about being ‘aimed at’ either. We all have autofocus eyes. Wherever we look the image will be clear (or as clear as it’s going to get) immediately. Even presbyopes will see clearly to as close as about a meter or two before needing their reading prescription. But not so with a telescope! You’ll need to focus a 4x telescope (the most commonly prescribed power) at pretty much every distance you’d want to look, and especially as one gets closer. And, that’s the benefit of autofocus—it provides the most natural magnification possible, because wherever you look, from optical infinity (~20 feet; 6m) to as close as 13” (0.3m), the image will be clear virtually immediately—just like normal vision. This alleviates the major drawback of conventional telescopes—having to manipulate the device. All you have to do is look, just like normal vision! The less demand there is on the patient to operate the device the easier will be their adaptation. And that is exactly what our goal should be—to make the device as easy and natural as possible for the patient to use. Watch a manual focus bioptic wearer walk about the room. You’ll see them stop and start as they pause to refocus for different distances, raising and lowering their hand to focus the device. Now watch the autofocus wearer—they’ll walk around the room normally, smoothly, fluidly and without hand motion to manipulate the device. They’re moving in and out naturally to examine items, in exactly the same manner that normally sighted individuals do. Now, it’s the device doing the adapting, just like it’s supposed to be. Patients seek the widest field of view and new, modern technology to help them maximize their vision, and that’s exactly what the Falcon Autofocus Bioptic provides. It’s easy to demonstrate, fit and prescribe. It provides the low vision clinician with a compelling new tool to help address the needs of their visually impaired patients. 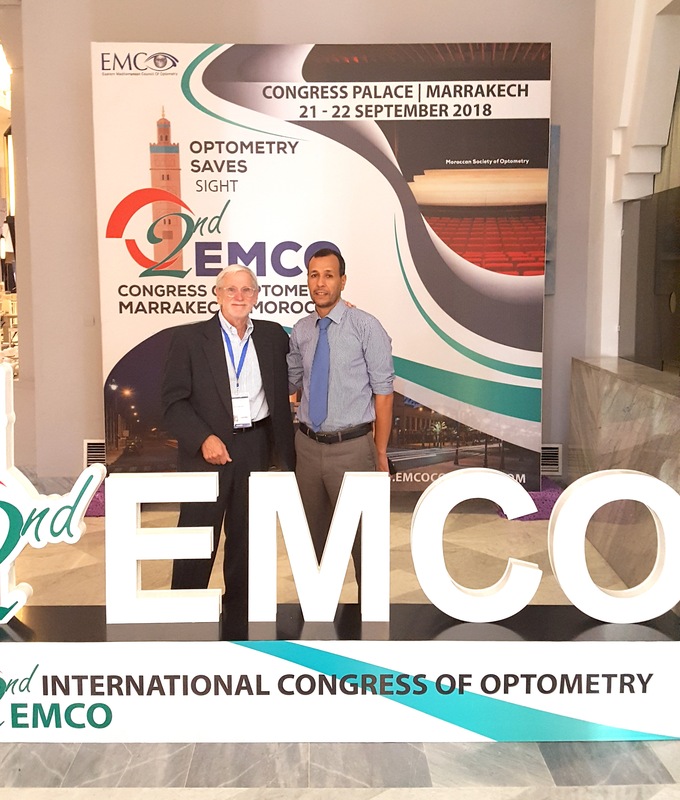 On September 21 and 22, 2018, I was an invited speaker at the 2nd Annual Eastern Mediterranean Council of Optometry (EMCO) meeting in Marrakesh, Morocco. While not quite located on the eastern Mediterranean, their first meeting in Beirut, Lebanon in 2016 certainly was! I want to express my appreciation to the EMCO Scientific committee, Dr. Hassan Awada, Dr. Yazan Gamoh, and Dr. Liana Al-Labadi for their invitation. I met optometrists and optometry students from all over the Middle East, northern Africa, India, Nepal and Bhutan. Speakers ranged from far and wide, including the US, Canada, UK, France, Australia, Sudan, South Africa, Lebanon, Palestine and Jordan. Topics ranged from myopia control (with Naidoo Kovin, CEO of the Brien Holden Vision Institute), scleral contact lenses, amblyopia, ortho-keratology, pediatric eyecare, and for me, of course, low vision. Co-sponsored by the Moroccan Council of Optometry and the World Congress of Optometry (WCO), the meeting attracted several hundred attendees. I was asked to present three COPE approved courses—the first on treating distance vision loss, a second on understanding and treating hemianopic and tunnel vision visual field loss, and lastly a bioptic prescribing and fitting workshop. The 2-hour workshop, limited to 12 attendees was filled with energetic, enthusiastic (and young!) optometrists. We discussed how to identify promising candidates, determine the appropriate prescription, establishing a prognosis, and especially the nuts and bolts of fitting the telescopes. Attendees played the roles of both patients and doctors and took turns fitting the Ocutech bioptics on each other. It didn’t take long for them to see how easy it is! We also demonstrated the new Ocutech Falcon Autofocus bioptic, which was a highlight and huge success! Since many spoke only French and Arabic, I was ably translated and assisted by Dr. Liana Al-Labadi, a 2009 graduate of the OSU School of Optometry, who now practices in Palestine. Dr. Greene with Hamid Nafis, chairman of EMCO 2018. The In’s and Out’s of Telescopes for Low Vision: Achieving a Balance between Acuity and Field of View in Prescribing. As we know, patients often explain that they cannot see far enough away to perform whatever activity they have in mind. They must move closer in order to see it adequately—which they may or may not be able to do, or feel comfortable doing! Patients with 20/40 vision, however, rarely complain of difficulty seeing. Individuals are licensed to drive without restrictions with 20/40 acuity, and children are unencumbered in the classroom with that level of vision. It is reasonable to assume then, that if we can provide 20/40 acuity through the telescope, most patients should be reasonably satisfied with the functional benefit it provides. So, if the goal is 20/40, a 2x device should be adequate for an individual with 20/80 acuity, 4x for 20/160, and 6x for 20/320. If we prescribe higher magnification to achieve better acuity it will be at the expense of a narrower field of view, which is the major complaint of telescope users. Also, the higher the magnification, the greater the image motion due to head movement that may actually undermine the benefit of the higher power device. Clinically we find that users have increasing difficulty finding what they’re looking for when fields of view become narrower than about 10 degrees. So we always need to balance adequate acuity with field of view. Personally, I prescribe Galilean telescopes for powers 2.2x and lower, and Keplerian at 3x and higher. I have found that patients respond most well to telescopic low vision aids when their acuities are 20/200 (6/60) or better. Keplerian telescopes in 4x and 5x can readily provide 20/40 and the telescope fields of view are greater than 10 degrees. I like to tell my ophthalmology colleagues that their goal is to keep their patient’s vision 20/200 or better. Now with the wonderful success of Anti VegF treatments, many patients have acuity much better than that, making their response to low vision aids even more robust.